Charges have been filed against a suspect arrested in the fatal shooting of a man found at Keith Weiss Park about 7 a.m. on Dec. 1, 2013. The suspect, Jake Anthony Espinoza, 18, is charged with murder and retaliation in the 351st State District Court. He is accused in the killing of Luis Lara, 19, of Houston, who died at the scene. According to Houston Police reports, runners from MacArthur High School and other joggers found Mr. Lara in the early morning hours. He was dead from several gunshot wounds. And was a 2012 MacArthur graduate. A preliminary investigation determined Lara was involved in a physical fight with several other males in the park. During the fight, Lara knocked down the suspect, who pulled out a gun and shot Lara several times. Further investigation identified Espinoza as the suspect in this case and he was taken into custody last Monday, July 21, without incident and subsequently charged for his role in Lara’s death. 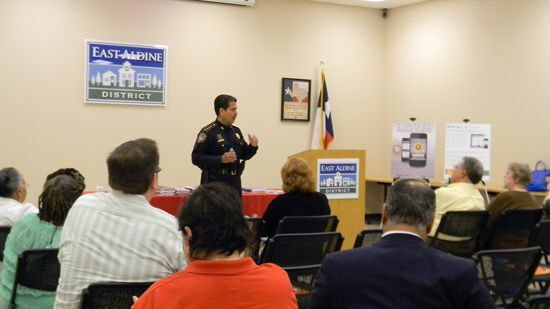 EAST ALDINE – East Aldine hosted a scam jam event to inform residents how to combat fraud last Tuesday mornng in the district offices. Special guest Sheriff Adrian Garcia attended the event and gave some advice to protect yourself and your family. Nowadays with this technology, Sheriff Garcia strongly suggests to get help and pay attention to your savings and checkings accounts, and credit cards. “Trusted sources let you know almost instantly if there are charges out of the ordinary in your accounts,” he added. 1.Are they asking for credit card or bank information? 2.Are they asking for personal information such as your medicare or social security number? 3. They know something about you but need to verify the correct information. If any of these are happening, hang up and report the call to Texas Senior Medicare Patrol at 1-888-341-6187. Also remember if it sounds too good to be true… it is! People do not give away money, cars, television sets or cruises unless they want something in return, meaning money ($$$) from you. Pay close attention to telemarketers. If you receive a call from a charity, tell them to send you the information in writing. During the scam jam there was a free shredding to safely dispose of outdated personal and financial documents. The event included presentations, resources and exhibitors by AARP, Crime Stoppers, Better Business Bureau and Texas SMP. Houston Police are investigating the shooting death of a 18 year old boy, whose body was discovered Saturday night in Keith-Wiess Park. The body was tentatively identified as Martin Ortiz, Jr. His body was found near the playground in the west end of the park, near Aldine Westfield Road. There are no known witnesses, and the reason for Ortiz to be in the park is unknown at this time. If you have any information, please contact the HPD Homocide Division, 713-308-3600 or leave an anonymous tip at 713-222-TIPS. This is the second teen fatality in the park within the last eight months. On December 1, 2013 the body of 19 year old Luis Lara, was discovered off a foot path in the northeast corner of the park. Lara was a 2012 graduate of MacArthur high school, but a motive and killer were not determined at the time. Houston police are investigating the fatal shooting of a male at 12400 Greenspoint about 12:20 a.m. last Friday, July 18. Houston Police officers responded to a reported shooting call. Upon arrival, they discovered the victim lying in the parking lot. The victim was pronounced dead at the scene. His identity is pending verification by the Harris County Institute of Forensic Sciences. Further investigation determined a possible suspect was seen in the area. 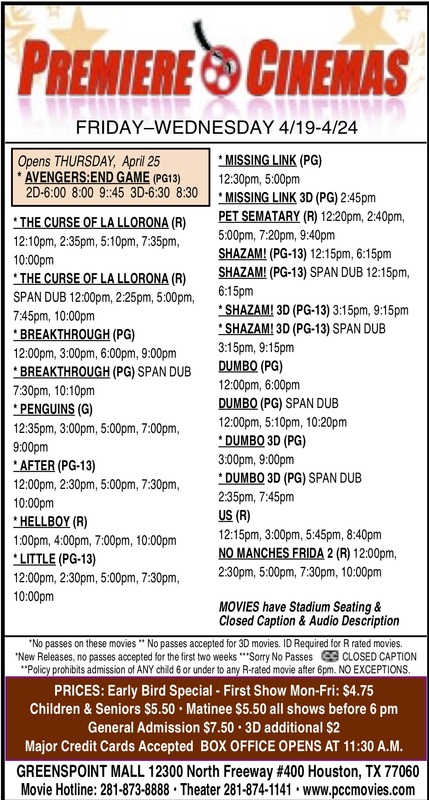 He is described only as a black male wearing dark clothing, last seen going toward the Premiere Theater. Investigators also learned individuals were in the parking lot, near the theater, when the shooting occurred. Any witnesses who left at the time of the shooting are asked to contact the HPD Homicide Division at 713-308-3600. Anyone with information about the case or the identity of the possible suspect(s) is urged to contact the Homicide Division or Crime Stoppers at 713-222-TIPS. EAST ALDINE – The Aldine District has repeatedly cited the Kroger store on Aldine Mail Route for nuisance abatement, regarding their smelly garbage. Now Harris County is suing grocery giant Kroger over garbage so smelly, it made investigators gag. It happened at the store at Aldine Mail Route and the Eastex Freeway, and the store off the Katy Freeway near Bunker Hill Rd. The lawsuit claims the smell of rotting garbage at the two Kroger stores was so bad, it violated the Texas Clean Air Act and the Solid Waste Disposal Act, Assistant County Attorney Lauren Hudson says. “The investigator describes the odor as one of the worst that she has ever smelled,” Hudson said. The lawsuit says the stinkiest store was on Aldine Mail Route. The smell was so horrible, the county issued four violation notices in five months. The lawsuit says Kroger was not emptying the compactor once a week as required by law. HOUSTON – Greens Bayou Corridor Coalition has been awarded a grant by the Texas Parks and Wildlife Commission for improvements to Jack Drake Park in the Greenspoint District. The Coalition will receive $98,280 for improvements to the park, including a new 0.4-mile trail, signs, parking, benches and a bike rack. In all, the Texas Parks and Wildlife Commission approved $5.25 million in federal grants for 38 recreational trail projects across the state. Eighty-two project proposals were submitted requesting more than $13 million in funding assistance. 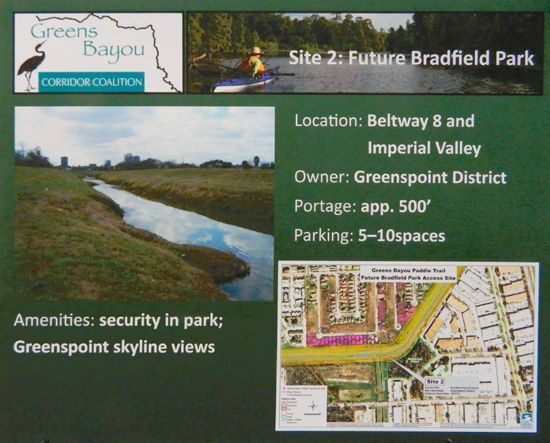 Jack Drake Park (formerly Bradfield Park) is located on Bradfield Road in Greenspoint. Recently, the park was officially named in honor of the District’s former president who served as president from the District’s founding in 1991 until his retirement in December 2012. 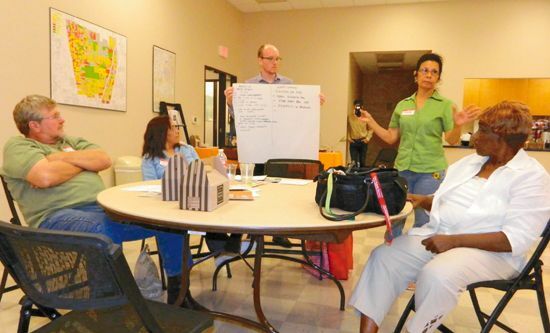 EAST ALDINE – Neighborhood Centers Inc. continued their meetings with the community, in the form of a workshop focused on the subject of “Visioning” the start-up of small businesses in the East Aldine area. The meeting was held at the offices of the East Aldine District last Thursday lunch hour, and was attended by about 40 persons from the community and partners of NCI. The purpose of these workshops is to hear the needs of residents in various fields, and to tailor a solution for NCI’s new facility that will respond most closely with the needs of the people in the neighborhood. This particular workshop focused on new start-up businesses, but others will focus on retail shopping, education, healthcare, and more, according to Jose Rivera of NCI. On the poster board above, the team at the table has listed benefits of starting a business in East Aldine: 1. Many consumers 2. In the middle of 5 major highways 3. Close to Airport 4. Good school district – Aldine ISD 5. Live in an Improvement District EAMD 6. Many businesses already located here, such as banks, grocery stores, churches, schools, health centers, the feeling was “We’ve Got It All.” 7. Strong Community Activists. In a question session, however, they also answered what’s missing: 1. Facilities for kids 2. Public Swimming Pool 3. Free Public Recreation Center 4. Diversity in Restaurants. The meeting was conducted bilingually, by NCI staff Jose Rivera and Carlos Paz. Carlos emphasized that the intent of these Visioning sessions was to have the spirit of Appreciative Inquiry. AI was a technique that NCI used, to get interview answers by using the Power of Positive Questions. Carlos mentioned that NCI would partner with other agencies in developing their programs, including East Aldine and Lone Star College, who were present at the meeting. Dr. Melissa Gonzalez of Lone Star College North said that they planned on holding classes in a new building in East Aldine by Spring 2016. To illustrate the Entrepreneural spirit that NCI expects to foster, they showed a video of a local man, Isaac Garza, who had started a personal training business with their help and encouragement. NCI plans to be a resource for new businesses, but also a conduit to others who can help, Jose Rivera said. The meeting was broken into about seven tables of participants, and a questionnaire form was filled out by everyone at the table. Using a team concept, table occupants learned about the others needs and interests, and then were able to summarize for the whole group, and suggest resources to help with their projects. Rivera said that this was only one of many “Visioning” workshops that would be held in the next few months, and other subjects would be seniors, community center facilities, healthcare, education, and other topics of interest to residents of the area. In their Visioning sessions, NCI interviews various members of the community to get their perspective on life in their neighborhood. So far, they have conducted about 100 interviews, said Rivera. The information is recorded on paper forms, and also on video and will be incorporated into a unique plan that NCI will propose in their new building for East Aldine. One key question that NCI always asks is “What kind of Future do you want to see in Aldine?” The answers are not always the same, depending upon who they are talking to, Rivera said. The new NCI building will try to be flexible and incorporate resources to answer many of these desires. One technique they intend to use is a large multipurpose workshop room, where start-up businesses can try different physical set-ups, and learn what works from their own efforts and the interaction with others in the same space who are also ‘start-ups.’ It is anticipated that some of these new businesses will then be funded by NCI partners, and may even have a space in the front of the building for a semi-permanent location for their businesses. Rivera said that the main thing is for new Entrepreneurs to maintain a positive attitude about what they can accomplish, not what is holding them back from getting started.